CNN speaks with Fareed Zakaria about the latest developments in Iraq, what the takeover of Mosul by the Islamist State in Iraq and Syria means for the country’s future, and whether the United States should get involved militarily. This is an edited version of the transcript. So what is going on in Iraq right now, because it seems like, almost overnight, the Islamist State in Iraq and Syria has moved from Syria into Iraq and is making dramatic progress. You know, part of it isn’t as unexpected as it seems. This group has been making some progress, associated groups have been making progress, over the last few months. Careful military analysts have been warning of these kinds of things. But the basic condition is this: The Iraqi government under Nuri al-Maliki has excluded and persecuted the Sunnis. As you know, any insurgency grows on the discontent of the population. And what has happened is that the population in Iraq has gotten more and more discontented. They're joining up with radical groups in Syria. And they are now moving to Baghdad. The second-largest city in Iraq has already fallen. One shouldn't exaggerate it in the sense these are a few thousand people. But here is the big deal – in Mosul, they robbed a government treasury of $500 million in cash. In Iraqi dinars, but in cash. They also got a lot of gold. So they might now be the most well-funded terrorist organization in the world. And you can buy a lot of the allegiance of the tribes in this area. So all of a sudden, they may find they have a lot more followers than they had just a couple of days ago. These U.S.- trained, U.S.-armed Iraqi military personnel, at least in Mosul and other parts, we've seen them take off their uniforms, put down their weapons, and they simply ran away. Why are they doing this? Because they are corrupt, inefficient, and they don’t have the same determination that the opposition does. You know, we saw this in Vietnam with the South Vietnamese government. When a government lacks legitimacy, when a government isn’t inclusive, the opposition is much more determined, much more ruthless than the government. And al-Maliki undid almost all the good that Gen. Petraeus did in Iraq with the surge. The surge was mostly a political operation where you were bringing the Sunnis back into the fold by bribing them, by promising them jobs, by doing all kinds of things to include them. Nuri al-Maliki reversed almost all of those measures and then went after the Sunni elites, went after the vice president, the finance minister. So what has happened is all the gains of the surge – the political surge – were lost. The Sunnis feel excluded. And they are now mounting this ferocious opposition. And the key thing to remember, the Shia are the majority in Iraq, so they thought they could oppress this Sunni minority easily. But in the broader Middle East, it’s the Sunnis that are the majority. If they're commandeering the area, what is the threat to the U.S.? It would mean more chaos and more complexity. I don't think it means some single dramatic thing. For one thing, I don't think Baghdad will fall. You never know. But remember, the Iraqi army is an army we trained, funded and sustained. It's somewhere between half a million and a million troops. We're talking here about 2,000 or 3,000 fighters, not particularly well equipped. So the Iraqi army has got to be able to hold Baghdad. It would be inconceivable to me that they wouldn't be able to do that. But what about the towns around increasingly falling into the hands of ISIS? It adds to the complexity. It adds to the reality that you have chaos in Syria which has now spilled over and created chaos in Iraq. And the United States has to ask itself, yes, this is terrible for us, but if we jump into the middle of this, are we going to make much difference? Do we even know which side to support? This is a very tough one for the president. And it is easy to take pot shots, but the mistakes have been a decade in the making, from the actual invasion of Iraq, on. So does the U.S. get involved militarily? I think with the current government in Iraq, it would be a mistake to offer major support like air strikes and things like that. Because ultimately, I don't think al-Maliki can put this back together again. I think what we should demand is a national unity government. Al-Maliki step down as prime minister. A more conciliatory figure takes his place. Bring in Sunnis as well. Under those circumstances, I think that the United States should support, but not this government. We should use a very light hand I think. Every move we make in the middle east comes back to bite us. We overthrow the democratic government of Iran to put the Shah in power... and get the Ayotollah instead. We back "freedom fighters" in Afghanistan against the Soviets... and get Al Queada. We support the nation of Iraq against the evil Iranians... and get Sadam Hussein. We enter a "quick war" in Iraq and stay there a decade (before they kick us out and then fall apart). We should use words to encourage democracy. We should send money to encourage and aid those in favor of democracy. And that's it. If they want it... they need to do the leg work. If they don't... then they can live with the results. We don't need to make matters worse by sending in troops or even arms. Our attempts to force our culture and values on them have ALWAYS failed. We should still present it to them as an option... but they'll have to take the steps themselves to go for it. The more we push (especially with military) the more they hate us. Zakaria is making great points. I posted a comment on another page where I endorsed the U.S. taking the lead. However, this article also points out other valid perspectives. Further, and probably in agreement with folks who took issue with my other post, we have invested American blood in Iraq over a very long period of time with the expectation that the people and the military would use that investment to create a stable Iraq by recognizing past failures and improving on them. But what we are seeing are people regressing to old beliefs and segregating themselves, the military just cowardly laying down their arms, the people are not rising up demanding more, and the government being corrupt and ineffective. I'd prefer seeing a responsible country rise up and set an example in the Middle East - and they had a chance to do so. Now I wish we could just build a wall around them to contain the terrorists. And I wish Pete, that we'd just stay out of the Middle East and elsewhere and just mind our own business and take care of problems here in the U.S. Just look at what took place in Vietnam, for instance. It took them decades to dig out of the mess we left there!!! Lol @ Eduardo...what will you do when the people vote Hillary Clinton in as the next POTUS? keeping failure puppet of Iran – Nouri Maliki – in the power is a big mistake and will cause to ruin the Iraq like the Syria. Wrong, Cyrusz. Nouri Maliki is a puppet of the West, not Iran! I share your sadness at the state of things. daren ... you don't need to look 10,000 miles away at radical muslims – here in America the domestic right wing anti-governement terrorists have killed thousands of Americans. And now we are guaranteed to see little school children in caskets once a week just like our NRA terrorists want. School shootings are good for the NRA – drives up gun sales and makes those white men very happy and wealthy. Don't be ridiculous, the probability of being a school shooting victim in the U.S. is very tiny in comparison to the probability of being a terrorism victim in Iraq. You know. I'm pretty darn liberal and even I scoffed at that. The NRA has every right to exist just like every labor union does. Screw all this polarized B.S. "But the basic condition is this: The Iraqi government under Nuri al-Maliki has excluded and persecuted the Sunnis. As you know, any insurgency grows on the discontent of the population. And what has happened is that the population in Iraq has gotten more and more discontented. They're joining up with radical groups in Syria. And they are now moving to Baghdad. 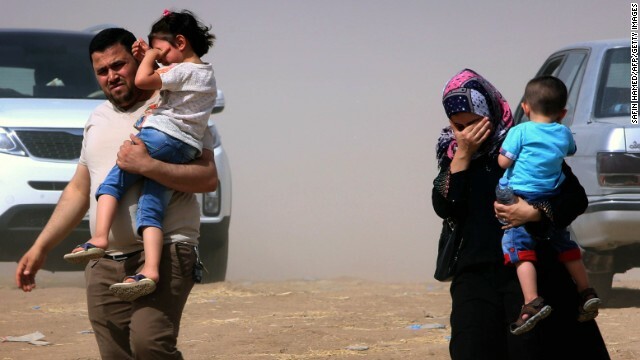 The second-largest city in Iraq has already fallen." "And al-Maliki undid almost all the good that Gen. Petraeus did in Iraq with the surge." In capitalist systems we have the concept of bankrupcy: when a company fails economically, it should go bankrupt, and investors should lose their investment. Transpose this to Iraq crisis: if problem root is al-Maliki, then he is not part of the solution but of the problem, so he and his government should go (my reference to "bankrupcy"). US military must NOT intervene to save the al-Maliki government !! A core condition of US military intervention must be that al-Maliki must recognise that they are the cause of this crisis, and that they must go. al-Maliki probably won't want to leave power so easily, but US should stay firm and make him understand that US military doesn't work for him to remain in power, but to defend US interests. And current US interest is not well served by al-Maliki and his divisive policies. Absolutely correct. The PM is the problem. He excluded the Sunnis. Democracy is meant to be inclusive. The inability to transcend Tribalism and the failure to embrace Nationalism spells nothing but doom. Unfortunately at this point whether the PM stays or goes.......its too late. we should not have been there in the first place but since bush did we should bomb the crap out of the terrorists and then arrest al malaki. iraq under the corrupt al malaki has turned into another country led by a moronic leader. lets face it democracy and islam can never co-exist. U.S. officials acknowledge that American weapons and vehicles have been diverted to extremists in both Iraq and Libya, but as of yet they have dodged the obvious questions related to their channeling of arms to insurgents in Syria. The irony here is that Washington's attempt to topple Syria is now threatening to bring down their puppet government in Iraq. Obama's promises to hold Assad's aggression in check never materialized. This is a bigger future US security issue that, along with Iraq, we will pay for exponentially over the next decade. Obama has basically spit on the graves of our servicemen killed in both previous conflicts in Iraq. When will America and it's current leadership realize that the expansion of Islamic terrorism left unchecked only means that we will spend more time and lives in the future protecting our country. If they need a new leader in Iraq, I'm all for the transfer of this administration to "help" them with their problems. Aren't ISIS the same insurgents who fight Assad regime in Syria? Only in Syria they are 'the good guys' and deserve all our support, but in Iraq they are 'bad guys' and we have to support Al-Maliki to fight against them. Why cant we have consistent policy in Middle East, like it's not our business. The only thing the us can do to stabilize a unipolar world is the unthinkable. Same question i had @ rosestool! Ironic isnt it...that we now have to fight the very group that we provided with weapons!!! Why do you gotta play the race card @ sly? we should care less who is running the country, if they present a problem to us--–we should use air power to achieve our goals ; we just need the will to do the dirty job of attacking from the air with powerful weapons. So you think we should just jump back in there in order to kill people who don't deserve to die, john? That's both sickening and perverted! Do you remember what happened in Baghdad on Feb. 13, 1991 when two American pilots bombed the Amriya air raid shelter killing over 414 innocent civilians? Anyone who advocates such a thing is obviously morally depraved. The U.S government always causes Iraq, Afghanistan, Vietnamese (...) think they fight for Americans, not for themselves because they get paid from Americans. The U.S does not trust any other people so whenever a war the U.S plans and fight by itself and take lightly on its ally forces. When the U.S does not need the war, it pulls out without considering its ally needs. It happened in Vietnamese war and currently in Iraq and Afghanistan. Therefore although Americans spend a great deal of money and blood but fail to keep their friend governments in solid since they lack a right political strategy. Why do Americans have to send their soldiers to other land? Why just help allies by providing them military aids? Other governments just need military and economics aids from the U.S, not soldiers but Americans never believe in others. It is the U.S problem after all! I don't agree with zakaria. The Army officers and the governor in Mousel are sunnies, but they didn't stand up against the terrorists unlike the other Iraqi officers in the rest of the country which they fought bravely. Almalki problem that he is trying to enforce the law on war lords so they use terrorists to push him back. The sunnies are only of the Iraq population. During Saddam's time they used to occupy all the government high position and control the oil money which produced in Shia areas. Some of Their leaders don't like democracy because they want everything back to their hands, and the election force them to share it with the rest of the country. they start support terrorists to fail the democracy. We should not abandon a democratically elected government chosen by the majority of Iraqi people and reward the ones who use terrorism and violence. Because if we do, everyone there will start to choose violence over democracy. I don't agree with zakaria. The Army officers and the governor in Mousel are sunnies, but they didn't stand up against the terrorists unlike the other Iraqi officers in the rest of the country which they fought bravely. Almalki problem that he is trying to enforce the law on war lords so they use terrorists to push him back. The sunnies are only 17 percent of Iraq population. During Saddam's time they used to occupy all the government high position and control the oil money which produced in Shia areas. Some of Their leaders don't like democracy because they want everything back to their hands, and the election force them to share it with the rest of the country. So they start support terrorists to fail the democracy. We should not abandon a democratically elected government chosen by the majority of Iraqi people and reward the ones who use terrorism and violence. Because if we do, everyone there will start to choose violence over democracy. How is it that NO ONE is reporting that elections in Iraq were held on 30 April and 14 June is the last day of Maliki's government. A new parliament is to be seated on 15 June and they have already agreed on a new prime minister. It is not Maliki. This all barring a state of emergency in Iraq which would keep Maliki in office. The current parliament has already refused Maliki's request, they want the dictator wannabe and his corrupt government gone. How arrogant! the Iraqi people decide who stays and who goes. If the US fails to support without the pre-condition of subverting the democratic will of the Iraqi people, others will happily step in: Russia, China, Iran just to name few. This is a matter of US interests too. Come on, Ali. You know better than that. We haven't nor ever had any right to be in Iraq! Zakeria is a Sunni Muslim and he is using CNN for his bias view on recent events in Iraq. He is avoiding to tell reader how dangerous ISIS is for Iraq, US ands the rest of the world. Blaming Iraq government at this time gives legitimate position to ISIS. When he blames Iraq government and it is silent about ISIS summary execution tell us that he is bias as much as other Sunnis who are helping ISIS. He is paid by Sunni Arabs. I get your sentiment Fareed, no one wants to get involved in a war in Iraq so soon, however ISIS is too brutal, I think Obama should use air support and at least try to save the Iraqi Republic from the Caliphate of ISIS. Have you ever thought of admitting that all what's happening in Iraq now is the result of the murderous invasion of Iraq by NATO, seeking WMD that never existed? Are you brave enough to declare that the US has no interest whatsoever in destroying Iraq, that never caused any real threat to the US or its citizens, but, rather, the Bush administration was pushed to do so by the Zionist lobby in Washington? What do you think of the American policy makers who destroyed Iraq, once an ally of the US, & handed it over to Iran, US enemy number one in the Middle East? Obama will decide NOTHING in Iraq -- The Kurds, Shia, & Sunni(Isis) will decide their own Future.